Agriculture, or farming, is a primary industry. Farmers cultivate crops and rear animals to produce food and other products. Agriculture is affected by many of the same factors and concerns as other types of industry.There are a range of agricultural operations from large commercial farms to small subsistence farms. All of these farms work to supply the constant demand for agricultural produce. Farms can be categorised according to what is being grown or reared, the size of the operation and the agricultural techniques being used. Sedentary farming is when a farm is based in the same location all the time. Nomadic farming is when a farmer moves from one place to another. This is common in some LEDCs. Subsistence farming is when crops and animals are produced by a farmer to feed their family, rather than to take to market. Commercial farming is when crops and animals are produced to sell at market for a profit. Arable farms grow crops. Crops are plants that are harvested from the ground to be eaten or sold. Pastoral farms rear animals - either for animal by-products such as milk, eggs or wool, or for meat. Mixed farms grow crops and rear animals. Extensive farming is where a relatively small amount of produce is generated from a large area of farmland. Intensive farming is where a large amount of produce is generated from a relatively small area of land. Inputs will be high to achieve a high yield per hectare. Inputs could be either fertilisers, machines or labour. Physical factors will determine which type of farming takes place in a particular area. Climate and relief are the dominant factors in determining which crops will grow and which animals are suited to the landscape. Arable farming is common in the south east where the summers are warm and the land is low, flat and fertile. The south east also has good transport links and farms are close to markets in towns and cities such as London. Human factors such as finance and proximity to markets are important to market gardening. 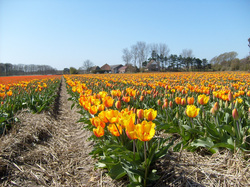 It is common in East Anglia where fruit, vegetables and flowers are grown. Hill sheep farming takes place in the north and west of Britain in highland areas such as Snowdonia and the Lake District. There are cool summers and high rainfall. The climate and steep land make these areas unsuitable for growing crops. Dairy farming is common in the south west and the west of England where the climate is warm and wet. There are also good transport links and good access routes to markets in these areas. The land may be flat or hilly, but not too steep. Mixed farming is found in areas where the climate and relief suit both crops and animals. It needs to be warm, but not too wet, and the soils need to be fertile and flat. Mixed farms need good transport links and accessibility to markets.